So who is this Simon Marshall-Jones bloke, then, who appears to have just leapt onto the genre scene from nowhere? Why has he been asked to write these monthly despatches from the frontlines – what qualifications does he have? What’s his pedigree? Those are all good questions, and this first little column for Read Horror will serve as both a brief introduction to me, and why I should be here, as well as answer who I am and what I do. Who am I? Well, I’m a 48 year-old writer, columnist, editor, publisher, artist and ex-record label owner, and a lover of genre fiction – sci-fi, horror, and contemporary fantasy (not the swords and sorcery variety – no particular reason, it’s just not my thing). I’ve reviewed books for Bookgeeks and Beyond Fiction (the latter now sadly deceased), and more importantly, I know how to string words together fairly coherently (just keep the wine out of my reach). I was brought up on genre fiction, having inherited an abiding love of literature and books from my late father – in fact, one of my earliest memories is of him sitting at the dining-room table, eating and simultaneously reading another chapter from his favourite book: JRR Tolkien’s Lord of the Rings. I also remember him coming to the end of the last volume and then immediately starting to reread the first one, The Fellowship of the Ring. He must have read it about forty times altogether, and he told me once that it was Tolkien’s use of language that appealed to him the most, and that the good professor’s love of English allowed his prose to flow like liquid poetry. I first picked up the book myself at around the age of six. The other thing my parents used to do was to simply leave books lying around the house, in places that were accessible to tiny ol’ me, in the hope that my natural curiosity as to what they were would be piqued. Suffice to say that their plan succeeded only too well: in the course of time I fell in love with words themselves, and not just the books. I liked the way words sounded, and how they felt in my mouth as I was forming them to pronounce whatever concatenation of syllables it was. They had a magnificently exquisite flavour all their own, and there were times, when I came across a particularly beautiful or tasty word, when I wished I could physically live inside that word. I read everything I could get my hands on – there was a small, but tightly-packed, bookshelf just outside my bedroom door on the landing facing the top of the stairs. The books covered all manner of subjects, and covered the whole spectrum from straightforwardly factual right through to fiction. I read about Ancient Egyptian kings and queens, about dinosaurs and aircraft, and the adventures of Dr. Who and The Three Investigators. There were more than a few Observer’s Books of whatever subjects placed there, with the words Olyslager Organisation on the copyright page were especially fascinating to me and became my absolute favourites – they were the compilers and editors of my favourite edition: the Observer’s Book of Cars, because at that time I was completely obsessed with the things. I also seem to remember several copies of vintage yellow-bordered National Geographics lining the shelves too, testament to my father’s interest in the greater world around him. My initial interest fiction-wise was in science-fiction and fantasy: Isaac Asimov, Robert Sheckley, Frank Herbert and Michael Moorcock being the particular ones I can remember (this was at a time when Mr. Moorcock’s Mayflower edition paperbacks were a mere 35p, and easily affordable even to a young child like me). Then, when I was eight, there was a defining moment for me: I discovered a copy of Elliott O’Donnell’s The Screaming Skulls and Other Ghost Stories, published by Foursquare. Not long after that came one of the Herbert Van Thal-edited Pan Book of Horror Stories, number eight in the series, I think (there was a severed head in a wastepaper basket on the cover anyway). Those two books set me off on a lifelong interest in all things macabre (actually, that’s not quite true – I was pressing my father to take me to the local cemetery at age three and then, a few years later on, building little headstones out of children’s plastic building blocks and subsequently lining them up on a bare patch of earth in the back garden – had my mother worried for while, in fact). I remember the first of those books in particular, because one of my primary school teachers, Mr. Singh, confiscated it when he found me reading it at break-time in class. My parents were horrified, I seem to remember. Later on still, I discovered Clive Barker, whose horror and contemporary fantasies did much to shape my view of genre literature, and instilled a desire in me to become a writer myself one day. In the end I failed to become an author, despite numerous attempts, and went to art college instead. Of course, in hindsight, I now wish I’d gone to university to study English – that would have been much more appropriate. But things are as they are and the past is an unreachable continent. The upshot of all the preceding rambling is that I loved genre books then and continued to do so throughout my teens and early adult life, and I very much still do now – so much so, in fact, that I started my very own imprint at the beginning of this year: Spectral Press. I publish a very specific form of book, the chapbook. What’s one of those, I hear you ask? Essentially a pamphlet, in my case containing a single short story by an author, very limited editions, signed, numbered and wrapped in some gorgeous quality artwork. Chapbooks have a venerable history, stretching back to medieval times, when chaps (booksellers) travelled the country to sell books, to wealthy people and institutions. Their apotheosis occurred in the Victorian era, with the political and religious tract. Spectral, however, specialises in the ghostly/supernatural end of the horror spectrum, and features writing from some of the brightest talents working in the genre today. If you’re unsure about a particular writer you’ve heard about, but don’t want to spend loads of money, then chapbooks serve as a very useful and reasonably-priced way of discovering what they’re about. I’ve published two so far: Gary McMahon’s What They Hear in the Dark and Gary Fry’s Abolisher of Roses, both of which have received excellent reviews from many quarters. Other authors lined up include Simon Kurt Unsworth, Alison J. Littlewood, Mark West and Wayne Simmons, as well as Paul Kane, Paul Finch, Cate Gardner, Terry Grimwood and many others of note. So I DO know what I am talking about – in other words, I am not just some windy scrote-bag spouting off because I am a frustrated writer (which I actually am, truth be told) or harbour an ambition to be the next Tobe Hooper or Sam Raimi. To coin a cliché: I love this genre I find myself involved in and Spectral is just my way of putting something concrete back. It was one of those occasional mad schemes I think up, in the vague hope that it might just work – that’s what happened with the record label, for instance, and it’s since been sold on. You don’t have to go the way I did, of course: ultimately, EVERYONE involved in the genre is contributing, whether by reading blogs like this one, or going out there and buying the books, or watching the latest horror film, or attending some con somewhere. It’s only through doing that, that the genre(s) that we know and love so well can continue to grow. This column, then, is my platform to pontificate about everything to do with our little corner of the universe: the books, the films and the people, and anything else I deem to be relevant. Sometimes I’ll ramble, other times I’ll be focused – just like the real-life me, in fact. As you will find out, if ever you meet me at the hotel bar at some convention somewhere. 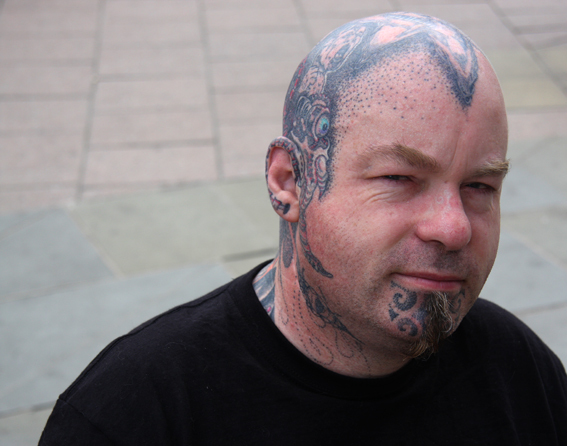 And, there will be no mistaking me: just look for the guy with a bald tattooed head.